Midori - made the front page of the New York Times when she was just 15 years old. She was performing at the famed Tanglewood Music Festival under the baton of Leonard Bernstein. At the time, she was already four years into her career, which she launched with a surprise guest appearance with the New York Philharmonic as the guest soloist at the 1982 New Year's Eve Gala. In the three decades since, Midori, who teaches at the Curtis Institute of Music, has carved out an impressive international career. On Friday, Nov. 2, she returns to Tucson to perform an encore to her 2012 Tucson Symphony Orchestra debut. "I am looking forward to returning to Tucson to perform the Brahms concerto," said Midori, who also holds the Jascha Heifetz Chair and is a Distinguished Professor and chairwoman of the USC Thornton School of Music Strings Department. "Needless to say, this work is one of the most beloved - and most challenging - in our repertoire. I have always loved playing it. 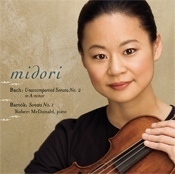 In a refreshing juxtaposition of repertoire, Midori's first new recording in five years, features J.S. Bach's Unaccompanied Sonata No.2 in A Minor with Bartok's Sonata No.1 in C-sharp Minor. The SONY BMG Masterworks recording pairs Pianist Robert McDonald with Midori in the Bartok. 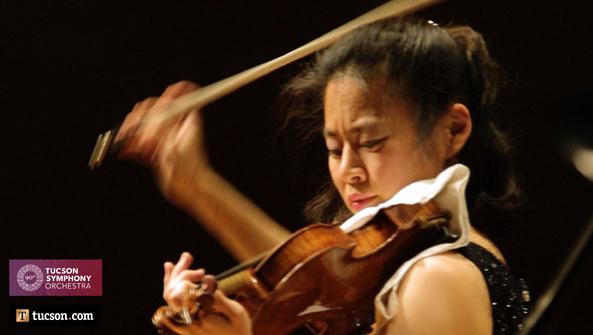 "Both in my own personal listening and in concert programs, I really enjoy combining works from diverse historical periods - I believe they shed light on one another in the most wonderful way," says Midori, "so I thought it would be terrific to put these two great sonatas next to one another on a recording."